This text is a complete resource for all the imaging technologies, not just plain film radiography. 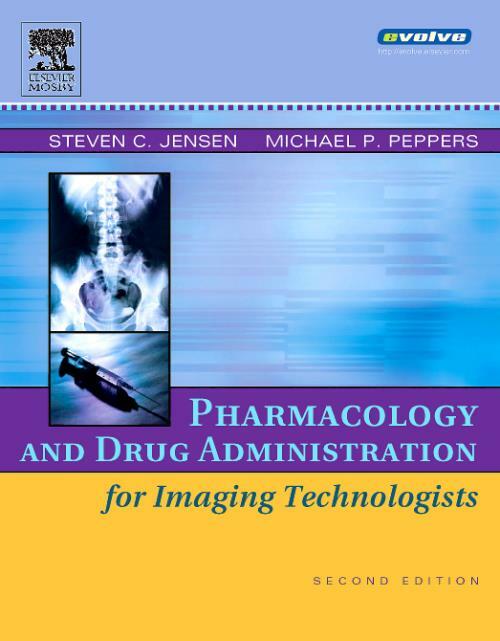 It provides introductory material on pharmacological nomenclature, drug classifications, pharmacokinetics, and drugs used in imaging. It also offers comprehensive coverage of diagnostic contrast agents, along with drug administration procedures, emergency responses to drug reactions, and legal and ethical aspects of medication administration. Paramagnetic Agent Adverse Reactions	NEW! Ultrasound Microbubble Agent Adverse Reactions NEW! Chest Tubes and Lines	NEW! Infections Prevention and Control	NEW! Hand Washing and Gloves	NEW! Bloodborne Virus Transmission to Healthcare Personnel	NEW! 10 Anxiety, Phobia and Conscious Sedation	NEW! Jensen, Steven C. Southern Illinois University, Carbondale, IL. Peppers, Michael P. Clinical Pharmacist, Des Peres Hospital; Per Diem Pharmacist, Jefferson Memorial Hospital; Per Diem Pharmacist, St. Alexius Hospital; Per Diem Pharmacist, Option Care, St.Louis, MO, USA.